For the purposes of this website, the Republic of Ireland, Northern Ireland and their jurisdictional offshore islands are all referred to collectively as Ireland. Ireland has a total area of 83,879km2. Of this, 69,774km2 makes up the Republic of Ireland (twenty-six counties) and 14,105km2 makes up Northern Ireland (six counties) - part of the United Kingdom. With an area of 24,229km2, Munster is the largest of Ireland’s four provinces. 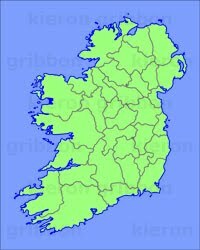 Lying in the southwestern portion of the Republic of Ireland, the province comprises the six counties of Clare, Cork, Kerry, Limerick, Tipperary and Waterford. With an area of 7,460km2, Cork is the largest of Ireland’s thirty-two counties. According to the latest Census data, Ireland has a total population of approximately 6,370,269 people. Of this, 4,582,169 live in the Republic of Ireland and approximately 1,789,000 live in Northern Ireland. According to the latest Census data, County Dublin has a population of 1,270,603 people. This makes it the most populated county in Ireland. According to the latest Census data, Leinster has a population of 2,501,208 people. This makes it the most populated province in Ireland. According to the latest Census data, the city of Dublin has a population of 525,383 people. This makes it the most populated city in Ireland. Rising to a height of 1,039m above sea level, Carrauntoohil in County Kerry is the highest mountain in Ireland. Ireland has approximately 4,235km of coastline. Munster has the longest provincial coastline, and Donegal has the longest county coastline. The River Shannon is the longest river in Ireland. From its source in the Cuilcagh Mountains in County Cavan to its mouth on the Clare-Kerry county boundary, the Shannon measures 386km. Its source is generally accepted as being Shannon Pot near the village of Dowra, although this is fed by several streams originating on higher ground several kilometres away. The Shannon is also the longest river in the Atlantic Archipelago / British Isles. The tallest waterfall in Ireland is Powerscourt Waterfall in County Wicklow. It has a drop of 121m. The largest natural harbour in Ireland is Cork Harbour on the Lee estuary near the city of Cork. Cork Harbour is among the ten largest natural harbours in the world, although its ranking varies from one source to another. The largest freshwater lake in Ireland is Lough Neagh. Portions of its 390km2 area are in Counties Antrim, Down, Armagh, Tyrone and Derry. Lough Neagh is also the largest freshwater lake in the UK and in the Atlantic Archipelago / British Isles. At a height of 707m above sea level, the highest lake in Ireland is Cummeenoughter Lake in County Kerry. It is located in MacGillycuddy’s Reeks between Ireland’s two highest peaks (Carrauntoohil and Beenkeragh). With an area of 135km2, Strangford Lough in County Down is the largest sea inlet in Ireland. Strangford Lough is also the largest sea inlet in the UK and in the Atlantic Archipelago / British Isles. With an area of 83,350km2, the Irish mainland is the largest of Ireland’s islands and second largest in the Atlantic Archipelago / British Isles. Ireland's largest offshore island is Achill Island in County Mayo. It has an area of 148km2. The largest freshwater island in Ireland is Inishmore in Upper Lough Erne, County Fermanagh. With an area of 9.9km2, it is also the largest freshwater island in the UK and in the Atlantic Archipelago / British Isles. Ireland’s highest sea cliffs are the north face of Croaghaun on Achill Island in County Mayo. From Croaghaun's 688m summit, there is an almost sheer drop to the Atlantic Ocean below. These are also the third highest sea cliffs in Europe. Croaghaun is the highest non-mainland summit in Ireland. The longest beach in Ireland is a continuous 20km stretch of sand in County Wexford connecting Cahore Point to The Raven Point. This includes Morriscastle and Ballinesker beaches. The northernmost point on the island of Ireland is Banba’s Crown (C:396:597) at the tip of the Inishowen peninsula in County Donegal. This is 12km to the northwest of Malin village. A rock outcrop (C:479:674) off the island of Tor Beg, also in County Donegal, lies in the Atlantic Ocean 11km to the northeast of Banba’s Crown, marking the northernmost point in Ireland as a whole. The southernmost point on the island of Ireland is Brow Head (V:768:231) at the tip of the Mizen Head peninsula in County Cork. This is 6.7km to the southwest of the village of Goleen. Little Fastnet (V:885:162), also in County Cork, lies on the south side of Fastnet Rock in the Celtic Sea 13.6km to the east-southeast of Brow Head, marking the southernmost point in Ireland as a whole. The easternmost point on the island of Ireland is Burr Point (J:664:628) on the Ards peninsula in County Down. This is 2.8km to the north of the village of Portavogie. Cannon Rock (J:685:535), also in County Down, lies in the Irish Sea 7km to the south-southeast of Portavogie, marking the easternmost point in Ireland as a whole. The westernmost point on the island of Ireland is Dunmore Head (V:301:980) at the tip of the Dingle peninsula in County Kerry. It is worth noting that Dunmore Head is sometimes incorrectly referred to as Garraun Point - the name of a headland marking the easternmost point of nearby Great Blasket Island. The most westerly of the Foze Rocks (V:154:892), also in County Kerry, lies in the Atlantic Ocean 17.1km to the west-southwest of Dunmore Head, marking the westernmost point in Ireland as a whole. This is also the most westerly point in the Atlantic Archipelago / British Isles. Some sources state that Ireland has the most westerly land in Europe. This is not true - Europe's most westerly point is in Portugal regardless of the criteria used.